I think it is always wonderful to receive a Christmas gift that is both practical, as well as beautiful and this duo from a Welsh model beauty is exactly what your manicurist would recommend for you. Bathing Beauty products will nourish & sooth the hands, as well as cuticles, leaving you with perfect hands to submit for a manicure or dip into gloves when you ventures for long walks outside, wherever your holidays or life take you. Reveal Hand polish & salve is made from fair-trade white sugar ( don’t eat it but use it to your skin’s advantage on the outside instead ) and rose petals. Take a wooden spatula or dip your finger into the glass jar ( don’t forget to breath deeply, as the smell of rose petals will remind you of the summer blooms) , stir it and then whisk a teaspoon sized dollop over your dry hands, then sit back and soak your hands in a bowl of warm water until the sugar has dissolved. Pat your hands dry and follow it up with the application of Glove. Avocado oil: contains vitamins A, C, D, E, K, B & squalene. Nurtures the skin, even the sensitive kind. Borage Oil: helps skin regeneration process. Particularly beneficial for dry or ageing skin and helps to improve the condition of the epidermal layer. Peach Kernel Oil: helps to slow down the ageing process, which is particularly noticeable on the hands and helps to delay appearance of wrinkles. Ingredients: Fair trade sugar, Organic Gratissima Persea, (Avocado) oil, Borago Officinalis( Borage) oil, Prunus Persicus (Peach Kernel) oil. Pelargonium Graveolens (Rose Geranium Essential Oil). Rose Petals. *Citral, *Geraniol, *Citronellol, *Farnesol, *Limonene, *Linalool, *Naturally occuring in essential oils. Now to the wonderful Glove of the non-wool or cashmere kind: Glove cuticle and hand conditioning salve. It is a balm that will condition your hands and cuticles. The little pocket jar with a screw on lid will be handy for handbags, so hopefully the balm will make regular nurturing appearance, keeping your hands and nails in top condition. This hand salve contains premium cold pressed blackcurrant seed oil, Fair trade shea butter (it is a perfect emollient which nurtures and moisturises the skin, as well as calms it down due to its anti-inflammatory properties ) and organic avocado oil. Simply apply a small amount to the backs of your hands and nail beds, rub in well and inhale its beautiful cocoa aroma. 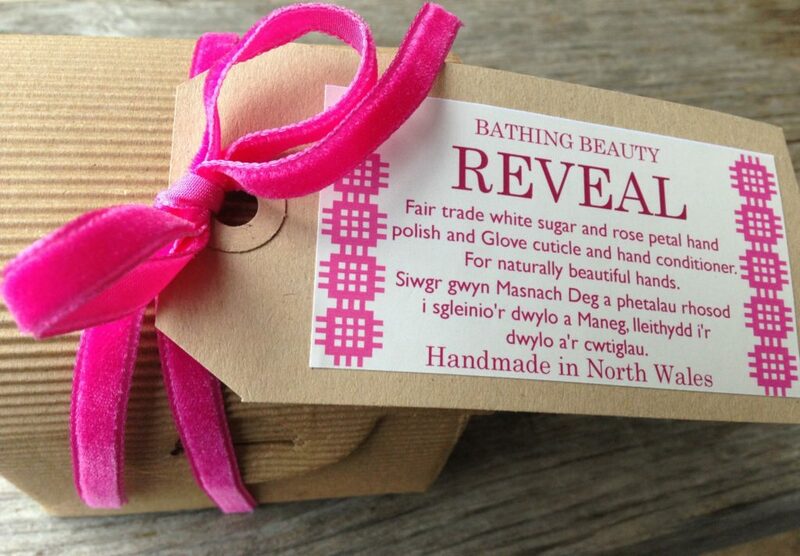 Xmas treat made easy and it will arrive beautifully wrapped in a little chest-like box with a distinct & beautiful design with a very distinct Welsh feel. INGREDIENTS: Butyrospermum Parkii ( Shea Butter),Persea Gratissima,( Organic Avocado Oil) Vitis Vinifera,( Grapeseed oil) Ribes Nigrum,( Black Currant seed oil) Cera Alba,( Beeswax) Styrax Benzoin ( Benzoin essential oil)* Benzyl *Cinnimate,*Benzyl Benzoate *naturally occurring in essential oils.